New Alien: Covenant Location Picture! A new Alien: Covenant location picture has now been posted, revealing a closer, clearer look at the set construction! After we revealed the first on location pictures of Alien: Covenant to the world, we continued to update the initial post with a few more long range images but nothing that was closer or clearer than the first pictures we shared. That has now changed! New Alien: Covenant location picture has now been posted, revealing a closer, clearer look at the set construction. Keep checking back with Alien vs. Predator Galaxy for the latest news on Alien: Covenant! 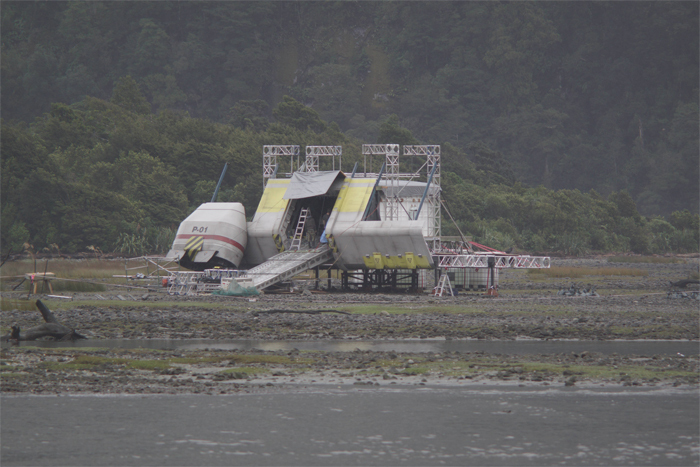 Awesome, the sound stage sets felt positively huge in Prometheus. I just felt that they were a little empty-looking inside the derelict ship, itself. I imagine they were much larger than Alien's derelict, but I much prefer them using tricks (kids in space suits) and cool lighting (with Ridley wafting purfume around with cardboard sheets) and darkness to achieve something otherwordly and spooky. I liked Prometheus enough, but I'd rather have the ship and temple not be empty with only holograms to fill up the space. Sidenote: I didn't really like the holograms or the ghosts. The Orrery wasn't terrible, but the ghost Engineers were too grainy. We've already seen a quick peek inside the studios too. He's using the Fox soundstages in Sydney. I guess they didn't nuke the site from orbit. How are we supposed to be sure? Can't be sure. I'm not sure when a lot of these were taken. So is it basically confirmed that the set has not been destroyed? Benjamin Rigby returned to New Zealand for several days. But part of the cast seems to be in the studio in Sydney. I hope a little something for tomorrow. Concept art , photo, poster ... just talking about the movie! Here is some nerd gold for all of my movie buff friends out there. Whilst in Milford Sound, we came across this strange spaceship sitting in the mist. As it turns out, this spaceship is the set for the newest movie in the Alien franchise and sequel to Prometheus, Alien: Covenant! And yes, they were filming. Mr. Ridley Scott and Mr. Michael Fassbender are somewhere in these photos! I asked Wayne Haag if he designed this piece on Twitter and he gave me a cagey reply. "Well God was responsible for Milford Sound and I can neither deny nor confirm any involvement in that other thing!!" Hahaaha, Weyne is great. God is responsible for the environment of Milford Sound and Wayne for that craft (He intentionally mentioned God in that reply ). He wasnt so satisfied with Prometheus story, and what about Covenant...? We expect that Covenant is going to look awesome just as Prometheus (or even better), but story is our main concern. He just said that Covenant is not what we expect... and what we expect the question is? It's not just a single person. Most of them are tourists who move on after a day. I am trying to find out specifics though. Can't we resolve this just by asking "the source" if he is still able to see the spaceship on site? Yeah, that "weathering" effect was also on all the earlier pics. It's not new. Perfectly possible. I'm just saying, the explosion doesn't necessarily mean the set was obliterated. Or could that have been a "weathering" effect? To try and scorch the ship to simulate entry burns? When were those pics taken? I thought they blew that sucker sky-high? You'd be surprised how big an explosion they can make these days without actually damaging anything around it. Some of those recent shots look a little singed, so it's not beyond the realms of possibility it survived intact. Unknown, I'm afraid. I'm wondering if they didn't actually destroy it but just shot some flames really high. The flight providers are getting in on the action now. These are both from pilots. Not that they're shots from the air. Sir Riddles must be fuming! But I guess that's what you get when filming at the Eighth Wonder of the World. I thought you were asking what a tide was seeing as I already mentioned the possibility. Thought you were maybe from Kansas or somewhere. Anybody know if this sort of thing happens in this area? The sound is connected to the ocean, so yes. Yep. I totally didn't notice that in your post. *Fixed your quotes. Corporal Hicks. It would also be interesting to point out the exact location of the ship on the google map, but so far I can't seem to pinpoint the spot. Anyone? It's just a little north of the north-western section of the airport runway. The cruise boat harbour would be to the north-east. What I'm saying is that with the tide, the ship could be in the water at some point during the day and on land on another time of day. Anybody know if this sort of thing happens in this area? It seems like it might. A satellite image from Google maps can clarify that for us if we get them from different moments. It would also be interesting to point out the exact location of the ship on the google map, but so far I can't seem to pinpoint the spot. Anyone? Sounds like the other actor was one of the ladies, most likely Katherine Waterston or otherwise Carmen Ejogo, Amy Seimetz or Callie Hernandez. "the alternate rising and falling of the sea, usually twice in each lunar day at a particular place, due to the attraction of the moon and sun." I know Fassbender and Crudup and one unknown actor are out there. Are there any actors actually filming anything out there or is it purely second unit stuff? But in the shot below it's quite clearly on dry land. I suppose it depends on the tide. Or otherwise the set was moved. Do you know when those aerial shots were taken? I don't. I asked but I'm awaiting the answer. They may have moved it further out for the explosion? Some ariel shots. You can see the ship quite clearly in the water in these images. I hated the Deacon scene. Felt so tacked-on. That said, I think I'd be more annoyed if they just left it hanging and never followed it up in the sequel(s). There's definitely a similarity in style which is cool but I don't think it's from the Prometheus. I'm finding it difficult to find proof that it is from the Prometheus, other than the fact that it says P-01 on it. I just find it difficult to imagine how a chunk of the Prometheus would manage to escape lv223's gravity when the ship exploded so close to the surface. But then again, this is the sequel to Prometheus. I think it more likely that it's simply part of the ship that this new crew of explorers used to get to "uncharted paradise", but is in fact a planet inhabited by loads of davids. Also, it just occurred to me, does anyone else think the deacon could've stowed away on the engineer ship shaw took? I mean, it never really shows for certain whether or not shaw had taken off before the deacon hatched. Only that it showed shaw taking off in a separate scene just before the scene with the deacon. So, there is actually a bit of an ambiguity here. PLUS, Ridley said there was gonna be every type of xeno in Alien: Covenant and what are the odds of there being 2 deacons created? Not high I imagine. Ridley sure does know how to find the best scenery! This movie is already looking gorgeous. Nice Boat. Is this School Days all over again? Gotta love those nice steep mountains, be neat to see a monstrous alien scaling them.